Provide comfort for the family of Josephine Johnston with a meaningful gesture of sympathy. of seven children, Ethel (Rennie), Alexander (Buster), Mary, Elmus Jr (Bud), Lloyd and Vera. 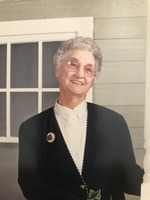 She grew up on the farm caring for younger children, milking cows and later as a cook for the threshing crew. Josephine was a quiet and gentle spirit who loved nothing more than to spend time with her mother. Bulwark, Josephine and Floyd bought Lacombe Billiards and moved to Lacombe to start their family. Arizona enjoying the warm weather and spending time with extended family for 13 years. residents and staff. In 2016 she moved to Royal Oak Village in Lacombe. The family is planning to have a celebration of Josephine’s life at a later date. To send flowers in memory of Josephine Ruth Vida Johnston (Ryan), please visit our Heartfelt Sympathies Store.